The man behind CB electronics is the charismatic Colin Broad. Colin who? For years, the film and broadcast community have relied on Colin Broad's expertise to solve a range of problems in the area of machine and system control. In fact, you would have to search hard to find a UK film dubbing theatre without at least one of his products, known to all and sundry as 'Broad Boxes'. They are also a common sight in dubbing theatres across the world. Because big film dubbing theatre requirements are so complex most of the previous products have tended to involve a degree of customisation to suit individual requirements. The SR series of Serial Remote controller / synchronizers is CB electronics first real 'off the shelf' product and is being distributed via specialist dealers such as Syence in the UK. The SR-3 will also act as a slave synchroniser / controller, locking up to three 9-pin machines to a master 9-pin input. Physically, the first thing which strikes you about the SR-3 controller is its size. There is no separate rack unit, all the electronics are in the control surface. For what it sets out to achieve, it is tiny. With panel space at a premium in sound for picture studios this is highly desirable. Power is taken care of with an in line power supply 'brick' or the unit may be powered via the 25 pin D connector on the rear which also handles time code I/O and GPIs. As you might expect there are a further four 9-pin Ds to connect the machines to be controlled. The only other connector is a BNC for video syncs, which the unit requires as an absolute reference. The gently sloping metal box, in a dark purple hammer finish, may be used on a desktop or panel mounted. The latter option is facilitated by four tapped holes in the case. The display is a two line 80 character pale green back-lit number with a small degree of up-tilt available to aid viewing from odd angles. I would have preferred more tilt but what there is most welcome. All the keys are chunky, square and internally illuminated. A neat and slim jog / shuttle wheel with excellent feel accompanies the transport controls at the bottom. The other keys are arranged in three groups, numeric with store and recall, a row of eight keys with a bank switch key below the display which will frequently be used for record selects and the largest group which contains, well, the rest! Anyone who has had any dealings with 9-pin controlled machines will be aware there is no such thing as a standard set of commands and many machines have idiosyncrasies which need taking into account if reliable control is to be established. One significant achievement of this synchronizer / controller is that it does exactly this. My Tascam DA-60 MkII DAT machine has defeated a number of other devices but the SR-3 recognised it immediately and controlled it better than any other device to date. The SR contains a library of machine specific protocols which should suit the majority of users requirements. If however, you wish to use a machine which the SR does not have a profile for, it is possible to experiment with a variety of parameters in the hope of achieving the desired results. In fact, on previous experience, if you do have such a machine the chances are it will be supported in a subsequent software update. In any multiple machine serial system it is customary to designate one machine as master. It will also operate as a 'Perfect Machine' I.e. the unit is used as a 'Virtual Machine' master. The performance of the system is largely governed by the dynamics of the master machine. With the SR-3, given a suitably quick master, or in 'perfect machine' mode, the synchonising is quick and accurate and control is tight with little of the 'rubber band' feel of some others. A total of 20 of the keys actually invoke MACROs including the nine below the display. These are user programmable from a library of functions currently comprising around 160 !!! options. If this unit has a fault it is that you can make life impossibly complicated and lose yourself in a maze of nested menus. On the other hand, if you need a weird function the chances are it is already available. In practice most users / installers will set the SR up for specific purposes and leave it alone. To this end the key legends and colours can be easily customised to reflect the functions they are programmed with. Needless to say the time displays can be switched to read in film feet (units of 16 frames) or time. I don't propose to go through all the possible options here but suffice to say there are groups of commands designed to make light work of ADR operation, DAT IDs and programme numbers, record control of multi-track machines and locator smarts such as AGAIN and LOOP. In addition to the direct 9-pin machine control capabilities the unit offers a timecode reader / generator. 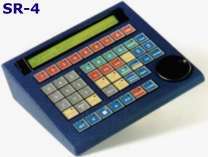 There are 6 GPIs and GPOs which can be used to remote the transport controls to existing keys on the user's panel and provide tallies, 'red light' control and so on. The SR-3 can also interface with Audio Kinetics ES-BUS protocols, Studer TLS 4000, Ampex and Timeline Lynx. This gives access to non 9-pin machines and can aid integration with existing installations. If all this sounds too good to be true; it isn't! But there is one area which could stand considerable improvement. The unit comes with the manual from hell! As a result of my previous incarnations in broadcast and film and more recently in writing reviews I have got to grips with a vast range of equipment and the associated manuals. I can honestly say this one is a classic. Most of the information you need is in there somewhere if you can find it but there are factual inaccuracies and most people will either tear their hair out or reach for the phone. I have even watched well respected facility engineers in an unusual state of bafflement when confronted with this manual. Syence tell me they are discussing a re-write with CB electronics. I hope this happens soon. Apart from anything else it would reduce the cost of support. Meanwhile, If you are looking for an incredibly versatile, neat compact and comprehensive multi machine control system and synchronizer for any number of applications then this is the only game in town at any where near this price point. Machine control is finally showing signs of growing up.